There's nothing like quality family-friendly live entertainment that appeals across the generations. 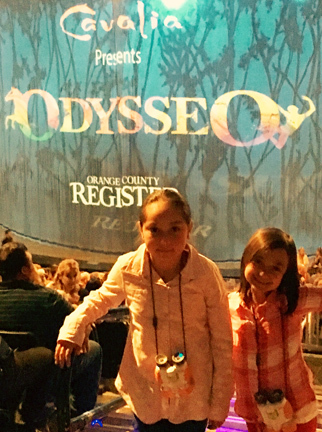 One of the finest examples I've ever experienced is Odysseo by Cavalia, now playing through March 13th in Southern California at The White Big Top in Irvine in Orange County -- a wonderful, soulful and engaging show my hubbie and I just took our daughter and her friend to see. It was simply magical: 65 spectacular four legged dancing horse stars representing a dozen different breeds, all with precise and impeccable training along with 45 artists in exquisite costumes performing. I was particularly touched by how the stunning looking giant creatures were handled by their human co-stars with such tenderness. You see, as you watch them in action, it's easy to imagine these equines being hypnotized with invisible strings attached to their legs as if they were being lifted flawlessly marionette puppet-style into the air. The connection between horse and trainer was very impressive and beautiful throughout the performance. At no time could any one of us sense the horses being fearful of the crowd, tense or tired in the least. Every single piece of music was worth an ovation, each song intentionally written to take your breath away. 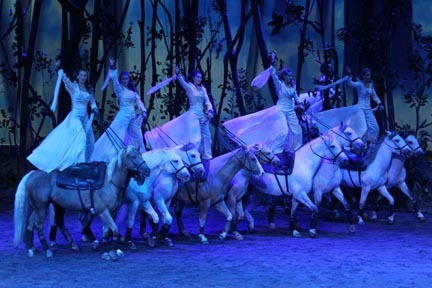 Each choreographed number was a true masterpiece, too, complimented by the dancers ability to wow the audience as they demonstrated their gymnastics expertise in vaulting on top of gracefully moving horses. In fact, during the show these beautiful animals performed just about every skill possible from prancing to gallantly trotting and even dancing. My 7 year-old daughter Sarah, who has been passionate about horses since she was a toddler, was mesmerized. I don't think I ever saw her even blink once and I am certain that she will never forget this unique experience. In summary, Odysseo, the new adventure by Cavalia is a must-see family show both young and old will enjoy. 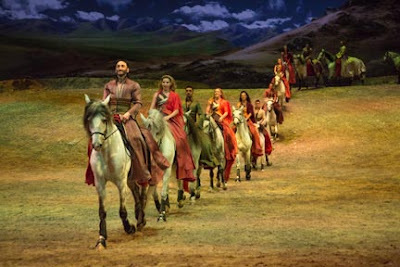 The largest known touring production of its kind, Odysseo Cavalia tickets are available now for performances at The White Big Top at the junction of the I-405 and SR-133 in Irvine for shows through March 13, 2016. Ticket prices range from $29.50 to $144.50 with a variety of VIP packages also offered for $149.50 to $269.50. For more details and to purchase tickets, visit the official website. 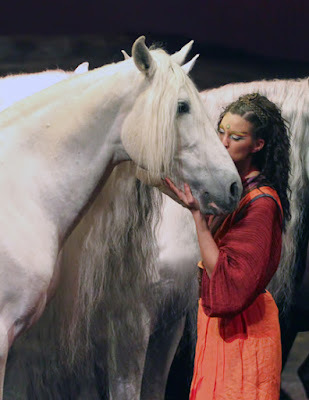 Another great way to stay up to date on this elaborate production and to see lots more photos of the show's beautiful 4-legged stars is to follow Cavalia on Twitter, Facebook, YouTube and Instagram. FTC Disclosure: MBE blogger Norma Perez and her family were invited to attend Odysseo Cavalia to facilitate media coverage for this post. However opinions in this post are Norma's alone. See complete FTC Disclosure information that appears at the bottom of MommyBlogExpert's main page and at the bottom of every individual post on this blog, including this one.